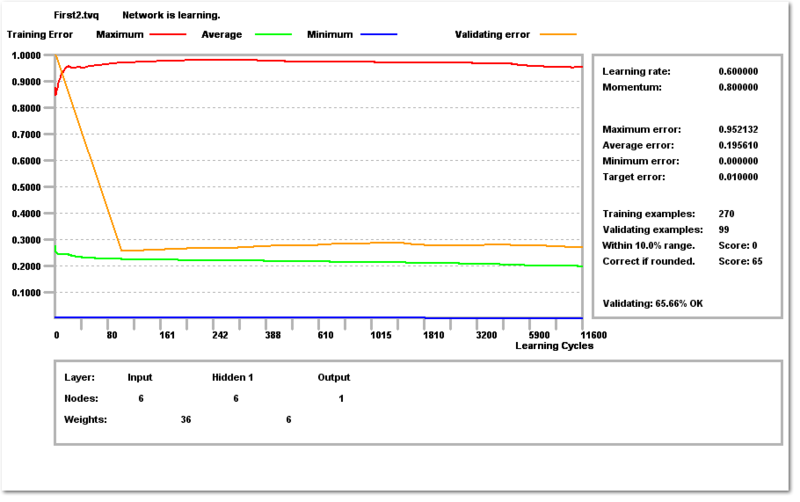 The Learning Progress view shows how learning is progressing. Up to 5000 graph points are recorded. This is sufficient for over 200,000,000 learning cycles. The graph is produced by sampling these points. The horizontal axis is nonlinear to allow the whole learning progress to be displayed. As more cycles are executed the graph is squashed to the left. The scaled errors for all example rows are used. The red line is the maximum example error, the blue line is the minimum example error and the green line is the average example error. The orange line is the average validating error.